Lens is like an email postcard that I send whenever my muse commands me. It contains a few paragraphs and a link to a related image and news of exhibits in which you can see my prints. Someday it will be a book. 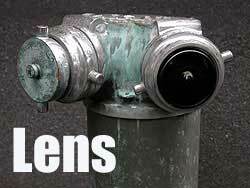 Click here to and I will alert you when I add new work via my free email newsletter, Lens. You may leave the message blank if you wish. Click here to . You must send the email from the email address you wish to have removed. If you use more than one email address, if you request to be removed from an address that is not on the list I have no way of knowing that you want the others removed as well, so please make sure you cancel by sending mail from the account you wish removed. Click here to your email address. Be sure to include your old email address and your new email address. The left box above should be pure black, the right box pure white, and there should be distinct but subtle differences between the others. If not, adjust the brightness and contrast of your monitor. AOL Users: Some versions of AOL have an optional setting that compresses graphics for faster viewing also makes them blurry. To see images properly you should turn this off. Click "My AOL" at the top of the page, click "Preferences", click "www", click "Graphics", then uncheck "Use Compressed Graphics".